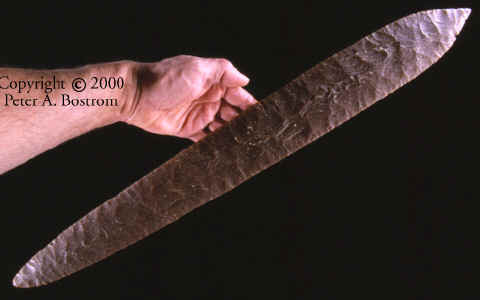 This extraordinary large Blade (one of the finest examples in the world) is a silent testimony to the highly skilled "flint smiths" or flintknappers of Pre-Columbian Mexico. No modern day flintknapper, that we know of, has been able to duplicated large bifaces of this size and thinness. One of the main problems that prevents someone to be able to develop this skill level is acquiring enough large pieces of high quality chert to practice on. Ancient highly organized urban societies whether they were located in Pre-Spanish Mexico or in the Mississippian site of Cahokia in the Central Mississippi Valley were supplied with all the raw materials the craftsman needed to make their stone tools. The large pieces of Mill Creek chert that was needed to supply the agricultural community of Cahokia with Hoes and Spades were supplied via the Mississippi River from the large chert mining industry to the south in southern Illinois. To this day large craters (some filled with water) can be seen where they dug for various types of stone. Large thin well-made blades (Bifaces) like this example were not items of ordinary use. They have been found in caches associated with burials or near ceremonial structures like alters. At the Aztec Great Temple in Mexico City, Bifaces of this type and material were found as offerings. In one case, a skull was found with two much smaller examples that had been thrust into the nasal cavity and mouth. This example measures two feet long and is expertly made. Most large Bifaces are found broken, and this one is no exception. They were snapped in the center with a clean break. In other words they were not struck like many of the Egyptian Gerzean Knives causing a pie shaped piece to detached. These clean breaks indicate the damage may have been deliberate. This artifact dates to approximately A.D. 1454, which would be sixty-seven years before the Spanish conquest. It is made of a semi translucent fairly high quality tabular chert.